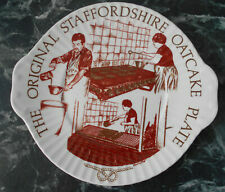 The original staffordshire oatcake plate. 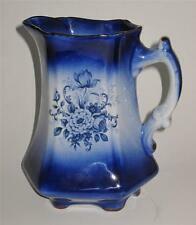 Staffordshire Pottery England MAYFAIR Blue Pitcher, 6 1/4"
You have found the missing pieces to your china pattern! 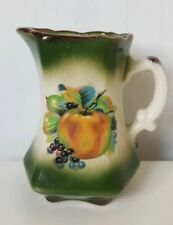 Here is a pitcher from Mayfayre Pottery, Staffordshire England. It feartures a cobalt blue top & bottom with blue floral center. We will normally get back to you within 24 hours. 'MAYFAIR BONE CHINA' STAFFORDSHIRE ~ BEAUTIFUL PAIR OF LARGE DINNER PLATES (28cms) DECORATED WITH A PATTERN OF ROSES. MAYFAIR BONE CHINA.Staffordshire, England. Gorgeous PAIR OF LARGE DINNER PLATES (DINING). 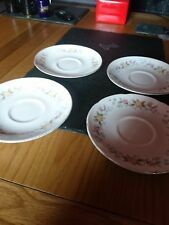 An 18 x piece Mayfair bone china coffee set in very good condition. Staffordshire, England. Fine Bone China. 6 x coffee cup saucers. In excellent, clean hardly used condition. collection from sk8 area. THESE ARE 54 PIECES OF ELEGANT STAFFORDSHIRE MAYFAIR DINNER / TEA SERVIEC WITH BEAUTIFUL PINK FLOWERS PATTERN. 5 X DINNER PLATES. 1 X MILK JUG. 1 X COFFEE POT WITH LID. 1 X TEA POT WITH LID. 1 X BIG SERVING OVEL PLATE. Beautiful set of three jugs in peach colour with flower pattern. Very decorative. In immaculate condition. Included are TWO Trios A milk jug. TWO Saucers. Lovely 8 piece set in cream with peach orange floral design. 2 match, 1 has bigger spaces between the design and looks to be from a later set and one has a fluted edge. A lovely cup and saucer made by Mayfair. It's a lovely pink floral and in good condition. Reduced! 3 Beautiful Vintage Mayfair Staff. Pottery jugs and dish exc con. 3 lovely jugs 4.5", 6" and 8" with dish All excellent condition. It is beautifully decorated with fruit, flowers, butterflies and lady bugs. Mayfair Staffordshire Bone China Cup And Saucer-Excellent Condition-Free Ship!!! 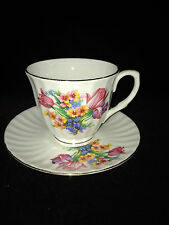 Mayfair Staffordshire Fine Bone China made in England cup and saucer in excellent condition. The Gibson tepaot has a stunning deep blue rose pattern accented with a heavy wide gold trim. It is very usable or a great piece for display. dating this piece in 1950's. FINE BONE CHINA - MAYFAIR -. 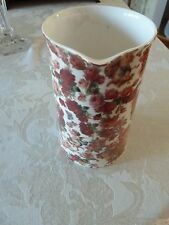 BEAUTIFUL STAFFORDSHIRE ENGLAND FINE BONE CHINA PITCHER! 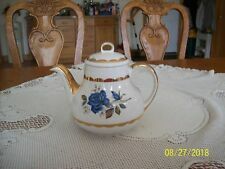 MARKED STAFFORDSHIRE ENGLAND -.